Donald Trump burst onto the political scene in 2015 spewing anger, hatred and racism. As a 3rd-rate real estate "developer " and reality TV host he was utterly ill-equipped and unqualified to be president. But he understood branding more than all of the other candidates combined. He stole the "Make America Great Again" slogan from Ronald Reagan, slapped it on a red baseball hat and the rest is history. 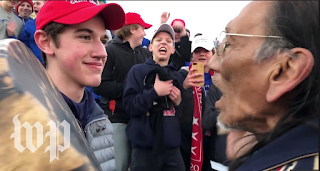 The controversial hat garnered worldwide attention again over the weekend when many MAGA hat-wearing students from a Kentucky Catholic school, attending a pro-life march in Washington, DC, got caught up in a viral media spectacle outside the Lincoln Memorial which found 16-year-old Trump-supporting white student Nicholas Sandmann and 64-year-old Native American activist Nathan Phillips in a tense face-to-face standoff. Phillips was attending the Indigenous Peoples March. "Nick Sandmann and the students of Covington have become symbols of Fake News and how evil it can be. They have captivated the attention of the world, and I know they will use it for the good - maybe even to bring people together. It started off unpleasant, but can end in a dream!" Sandmann's own defense is that he did nothing wrong, was not acting aggressively and was merely trying to "defuse" an explosive situation as he and his fellow students were under verbal assault nearby by four Black Hebrew Israelite protestors. He and his supporters, including his mother, have disingenuously used this verbal assault as justification for his and his pals' behavior towards Phillips. They claim the real victims are the kids. But the tape doesn't support that contention. Video of the entire roughly 90-minute episode, while indeed proving the kids were targets of vile homophobic, racist verbal attacks, also shows as many as 50-75 Covington Catholic High School students, many recording the encounter on iPhones, loudly and excitedly shouting, jeering and egging on a smirking Sandmann like hopped-up frat boys at a midnight rave. They could've simply walked away. They chose to engage. These weren't just 'innocent teens.' They were MAGA-hat-wearing teens. And that changes the entire dynamic of the situation. To non-Trump supporters, the red MAGA hat is a symbol of divisiveness. Of intolerance. Of sexual, gender, ethnic and racial animus. To non-Trump supporters "Make America Great Again" really means "Make America White Again." To non-Trump supporters, the red MAGA hat is the modern-day version of the white KKK hood. That's because Trump is a racist. There's no disputing that, especially against decades of unequivocal bigoted behavior including housing discrimination, the Central Park Five fiasco, his birther campaign, embracing David Duke, verbal attacks against people of color, the Muslim ban, defending neo-Nazis and his relentless campaign against black and brown immigrants. To be sure, the red MAGA hat is Trump's white hood. *The group displays excessively zealous and unquestioning commitment to its leader and regards his belief system, ideology, and practices as the Truth, as law. *Questioning, doubt, and dissent are discouraged or even punished. ‪*The group is elitist, claiming a special, exalted status for itself, its leader(s) and members (for example, the leader is considered the Messiah...on a special mission to save humanity). ‪*The group has a polarized us-versus-them mentality, which may cause conflict with the wider society. ‪*The leader is not accountable to any authorities (unlike, for example, teachers, military commanders or ministers, priests, monks, and rabbis of mainstream religious denominations). ‪*The group is preoccupied with making money. Trump and his cultists proudly wear the red MAGA hat like a family crest. So when a bunch of rowdy teens surround a Native American elder while wearing this hat they're bringing to the encounter everything it's come to stand for. It's not...just...a...hat. It's offensive, its insensitive and it's intimidating. Perhaps we can't ascribe the underlying racism of Trump's MAGA credo to these kids. Perhaps they're just dopey teens who 'didn't know better.' But now they do. And if they don't want to be associated with the ugliness that this hat represents, they should immediately apologize to Phillips. And they should begin to understand and appreciate what the phrase "Make America Great Again" might mean to indigenous peoples who for centuries had been robbed, slaughtered and are still clearly disrespected. People whose experiences throughout history weren't so "great."